PLEASE NOTE THE DATE HAS BEEN CHANGED FROM MARCH 30 TO SATURDAY APRIL 6TH. After more than two years of planning, the Village of Williamsburg, Clermont SWCD and other project partners have removed a low-head dam on the East Fork Little Miami River, restoring its natural system and opening up 85+ miles of free-flowing waterway. A ribbon cutting ceremony was held on November 30 to celebrate the accomplishment. The first steps were taken on October 13, when the dam was notched to slowly release water downstream. As the river level receded, 58 volunteers helped the project team collect and relocate over 700 freshwater mussels that live in the river bed. Some of these were relocated upstream, while others were relocated to Mill Creek in Cincinnati in an attempt to re-establish a mussel population here. (click here to see the story aired by Local 12 News). The dam was constructed in the early 1930s by the Village of Williamsburg as part of a local water works facility. The drinking water plant served approximately 2,300 residents through the late 1990s, at which time Ohio EPA began to require significant improvements to address pesticides in the water. Ultimately, the Village concluded that the cost of constructing a new filtration system was more than it could afford, and the decision was made to switch to Clermont County’s drinking water system. The Williamsburg drinking water plant was permanently closed in 2003. As a result, the dam no longer served a purpose. Public safety was another reason for removing the dam. 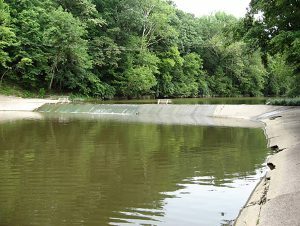 The dam had been a liability for the Village of Williamsburg, as people who boat, fish, or play on or near the dam unknowingly risked serious injury and even death. Recently, Williamsburg residents dedicated a monument in memory of two young brothers who drowned in the turbulent backwaters of the dam in the mid-1970s. Many members of the community voiced support for removing the dam to avoid any potential accidents in the future. More than 50 dams have been removed across Ohio over the last few decades. 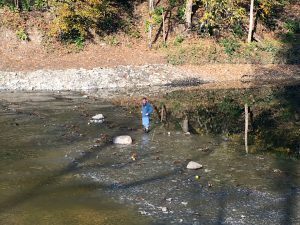 Clermont SWCD assisted with a complete dam removal in Brown County in the East Fork watershed in 2014; the District is also working with Valley View Foundation to remove another low-head dam on the East Fork in downtown Batavia. The dam removal project was funded through Ohio EPA’s Water Resource Restoration Sponsor Program. For additional information, please contact Becky McClatchey, Natural Resource Specialist for Clermont SWCD at (513) 732-7075 ext. 6 or at rmcclatchey@clermontcountyohio.gov. American River’s video on dam removals: Taking a Second Look: Communities and Dam Removal.